Why is Nozzle Lift important to know? Nozzle lift is important because it provides you your actual lift force, subtracting out the weight of the balloon (and any associated zip ties or accessories permanently attached to the balloon). Along with your payload weight, this value is most useful in making your predictions in terms of climb rate and maximum burst altitude for a given volume of helium. Nozzle lift does not include the weight of any parachute, payload, or anything else that will be lifted by the balloon. How do I measure nozzle lift? The easiest way to measure nozzle lift is during filling of your balloon. After detaching any filler hose attachments and anything that will not be attached permanently to the balloon during your flight, use a fish scale or other measurement device to record the amount of lift generated by the balloon. If a fish scale or other measurement device is not handy, you can attach a bucket (or jugs of water) to the balloon, and continue to add weight until the balloon is neutrally buoyant. At this point, you know that the attached amount of mass equals the nozzle lift, so you can detach everything and measure it on a normal scale to figure out your nozzle lift. Lastly, to obtain an estimate of the nozzle lift based on the amount of helium that was actually used to fill it (if not an entire tank of known volume), one can estimate the volume by using pictures. Take a picture of the balloon, estimate the height and width of the balloon in the X and Y axes, and using the equation in the References section at the bottom of this post, approximate the balloon as a 3D elliptoid and estimate the volume of helium in the balloon to calculate lift (don't forget to subtract the weight of the balloon to get nozzle lift!). How is Nozzle Lift used? To calculate how much helium is required to attain a certain burst altitude (and resulting climb velocity), we recommend using the helping calculator at Habhub here. Input your measured payload mass: the weight of everything that will be attached to the balloon (tracker, parachute, attachment lines, heaters, etc.). Do not include the mass of the balloon or any zip ties or other items that will be attached to the balloon when you measure nozzle lift during filling. Specify either the target burst altitude or your target climb rate. Note: depending on your balloon size and the weight of your payload, there is a maximum obtainable value for the burst altitude that is possible. The lower the altitude you specify, the more helium will be required during the fill. The calculator will specify the volume of helium required, the time of flight, and other useful parameters. The Habhub calculator has some advanced options for the advanced user that wishes to fine-tune the calculations. Gas - If using a gas other than Helium, make sure to change the Gas option so that the appropriate lift value is calculated. Different gases (of the same volume) result in different lift values! Air density - the air density assumed by the Habhub calculator is an average value (at sea level). If you are launching on an especially hot or cold day, you can adjust the density of air accordingly to provide more accurate predictions of lift values. Burst diameter - this is an approximate value of the burst diameter for Kaymont balloons of the HAB-1000 size and below. For more refined estimates of burst altitude for different size balloons, you can adjust this burst diameter (in meters) based on this page here. Gas Density - this is automatically adjusted based on the gas that you select. Air Density Model - default lapse rate for density vs. altitude. To see how the density of air changes vs. altitude on a standard day, check out the altitude vs. density calculator here. Leave this as default unless known to be something different for your launch location. Balloon Cd - This is the default drag coefficient for your balloon. A 3D sphere has a drag coefficient of Cd=0.47. However, as you know when the whether balloon is climbing and has a payload mass attached to the bottom, it takes on a slightly elongated shape and is actually more streamlined (lower drag) than a sphere. 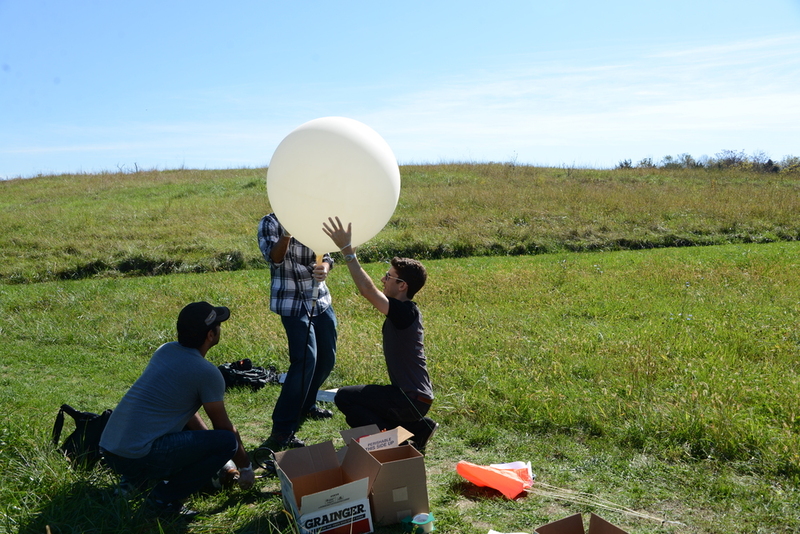 Cd=0.3 is the default value used for weather balloons, which can be adjusted if you have better data based on past launches for your particular configuration. Some common drag coefficients for standard shapes can be seen to the right. Note: for now, this calculate all the drag is only being generated by the balloon and the payload is not creating any drag. We will expand upon this in future SPACE Camps. Acceleration - Unless you're launching from the moon or the International Space Station, leave this value as the default value for the acceleration of gravity on Earth! Once the volume is known, your lift for a given gas can be estimated by figuring out the amount of heavier air that is being displaced by the lighter helium. The buoyant force can be calculated by: Where ρ is the density of air and helium, g is the acceleration constant of gravity, and V is the volume of the balloon. Habhub sets the drag force plus the payload weight equal to the nozzle lift force in order to calculate the ascent velocity. This is Newton's Second law, the sum of the forces in the vertical direction equals the mass times the acceleration. ∑F = mass*acceleration, where the acceleration is zero for our balloon (during ascent, the balloon is climbing at a constant velocity for a given altitude). Note that the drag and the payload weights are acting in the same direction (towards the ground), and the nozzle lift (which includes the weight of the balloon already being accounted for) acts in the upwards (opposite) direction. Since all variables are known except for the velocity of the balloon, this can be solved for and is provided. We will cover how to bring wind into the equation in future SPACE Camp editions. Space on, cadets!